The ordinary lowland Scots in the eighteenth century typically shared their primitive rural dwelling with their livestock. A crude log cabin protected the early Scottish settler from the wild animals of the Scarborough forest. 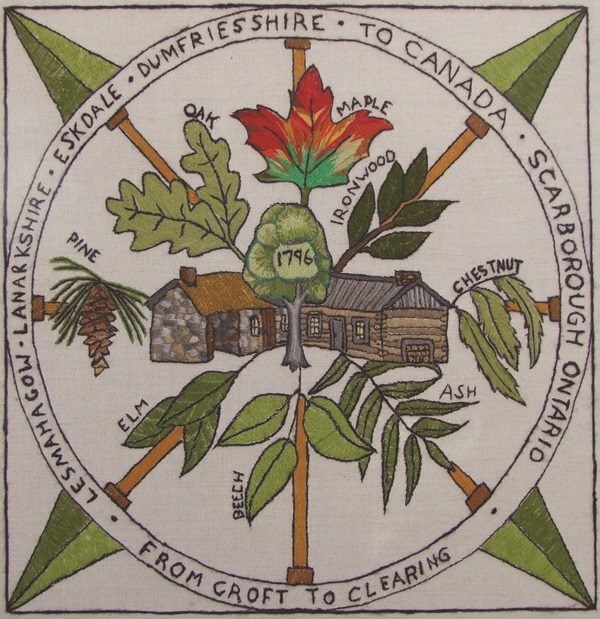 The Maple tree, made famous in Canada by Lesmahagow-born Alexander Muir, camouflages the distinction between Scotland and Canada -- the cultural and economic ties between the old country and the new remained profoundly strong for several generations and should, today, be energetically renewed through appreciation of a common heritage. At an International Exhibition in 1862, “James Lawrie of Scarboro has won a medal for specimens of Canadian timber. Mr. Lawrie had on exhibition twenty-one specimens, in logs and planks, and nearly every one was cut from his own farm. They consisted in part as follows: Pine, Hemlock, Cedar, Balsam, Tamarac, Elm, Basswood, Beech, Hard and Soft Maple, Red and White Oak, White and Black Birch, Ironwood, Blue Beech, Cherry, Hickory.” Several of the Dumfriesshire Thomsons also had sawmills. Quite likely so did the McCowan brothers from Lesmahagow, as their first rented farm had, running through it, a steep ravine with quite a substantial water power potential. Sir, You will have the goodness to give me an acct of the wood you have deld and to whom you delivered the same. Joseph Lee, 39 King St. Toronto, A-- 20/38. bheathaichean. Mar a h-uile neach eile, lorg an fheadhainn a ràinig coille Scarborough ann an Ontario fasgadh bho na h-eileamaidean agus bho na h-ainmhidhean fiadhaich ann am bothain loga. Tha a’ chraobh Malpas, a chaidh a dhèanamh ainmeil ann an Canada le Alasdair Muir, a’ falach an eadar-dhealachaidh eadar Alba agus Canada gu ìre – na ceanglaichean cultarach is eaconamach eadar an t-seann dhùthaich agus an dùthaich ùr, ’s iad air fuireach gu bunaiteach làidir airson mòran ghinealaichean agus a dh’fhaodadh san latha andiugh a bhith air an ath-ùrachadh le spionnadh tro ghabhail ris agus tlachd à dualchas coitcheann.